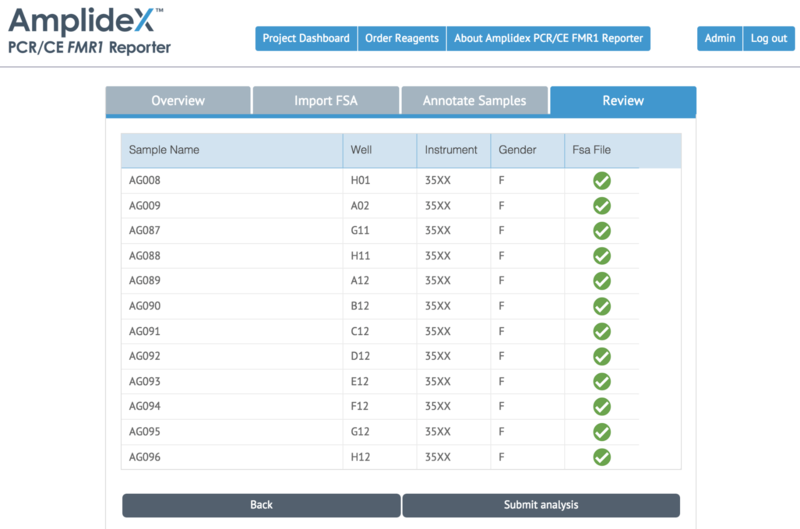 AmplideX PCR/CE FMR1 Reporter software provides instant fragile X repeat genotype analysis along with automated QC checks, sample tracking and trends, and reliable minor allele detection. Built for speed, accuracy and convenience and armed with proprietary algorithms validated using thousands of CGG profiles, the software cuts through tedious analysis bottlenecks to deliver dependable results every time.. for every sample. The FMR1 CGG repeat region was amplified for 1273 residual clinical samples using the AmplideX PCR/CE FMR1 Reagents*. 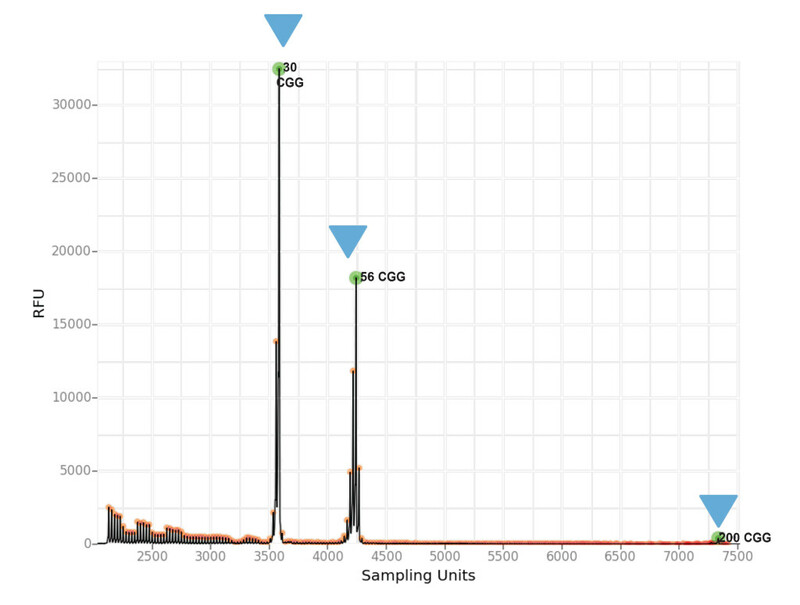 These PCR fragments were then run on an ABI 3500xL Genetic Analyzer to generate CE profiles for analysis. Manual annotation was performed by trained operators for all residual clinical samples using GeneMapper® 4.1 software (ABI). An algorithm was developed using 167 residual clinical samples representing the full spectrum of FMR1 genotypes to automatically produce genotype results. Testing was then performed on an independent cohort of 1106 clinical samples spanning full FMR1 genotype range. 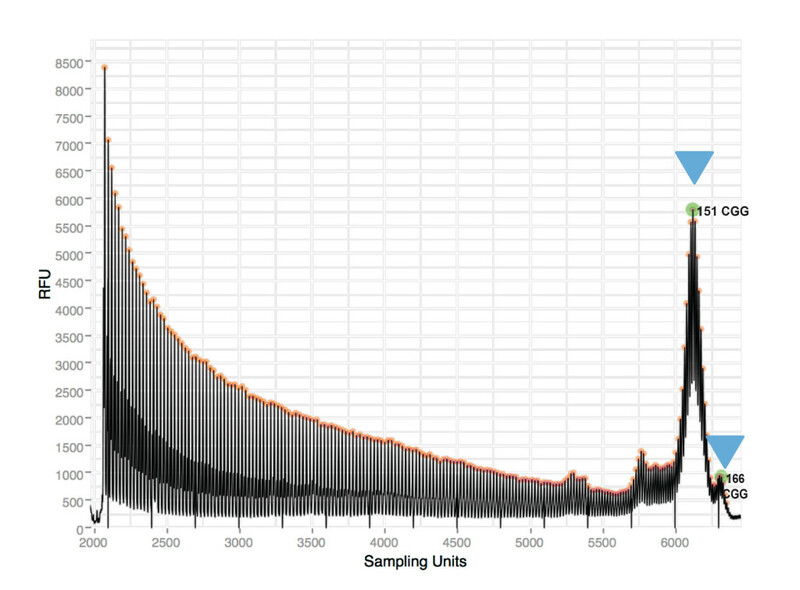 **Distribution of FMR1 genotypes in the general populations (orange bars) (Tassone et al., 2012) vs. the distribution of genotypes in the 1106-sample validation dataset (blue bars). The validation data included a larger than naturally observed set of abnormal alleles specifically chosen to challenge the software. All clinical samples passing QC criteria (n=1035) were correctly genotyped according to ACMG-suggested accuracy sizing guidelines (Monaghan et al., 2013). 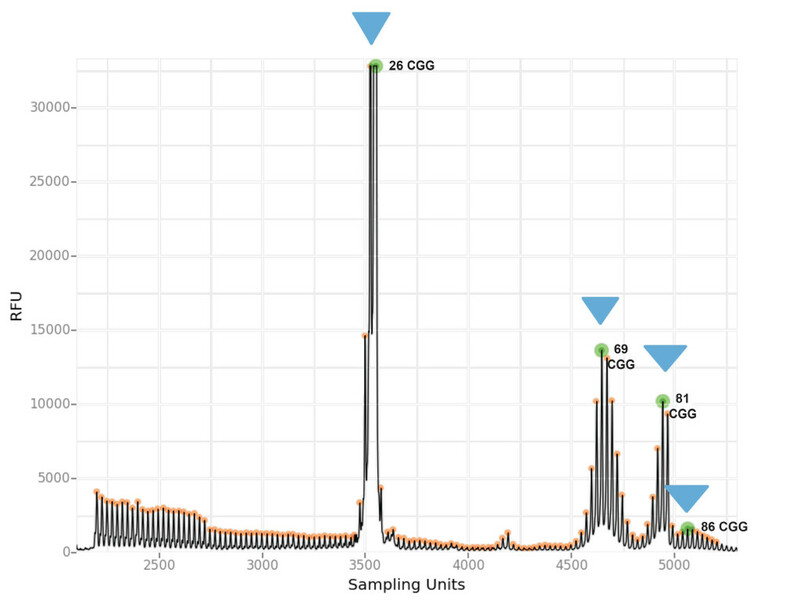 71 samples failing QC were previously manually confirmed to have poor/no amplification, confirming that the software can flag subpar results. 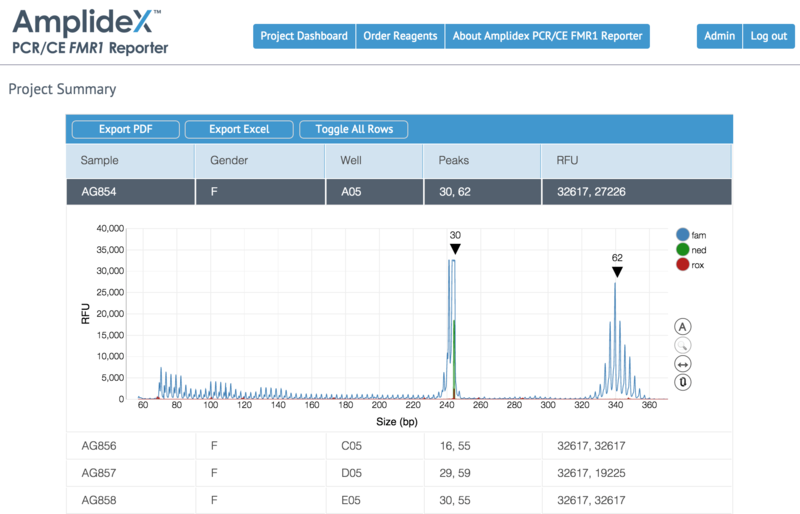 Finally, the AmplideX PCR/CE FMR1 Reporter* software platform was built to provide an intuitive and easy-to-use user interface to the algorithm, as to dramatically improve analysis time (>100 fold decrease in time-to-result) for lab technicians using AmplideX PCR/CE FMR1 Reagents*. 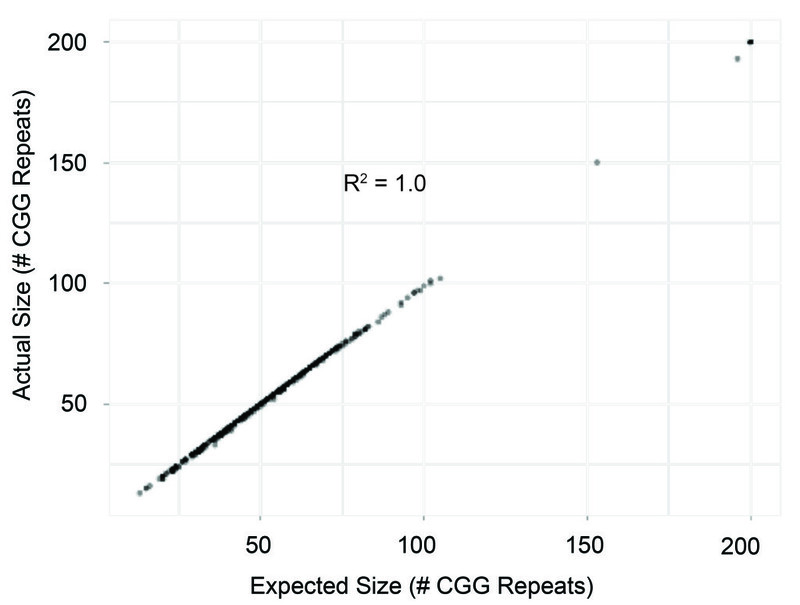 **Automated sizing of the FMR1 CGG repeat region was 100% concordant (within ±1 repeat) with corresponding manually-analyzed data across a >1000-member test sample set; results were obtained in less than 1% of the time needed for manual analysis. The comparison between manual and automated sizing of all major alleles revealed a quantitative correlation. 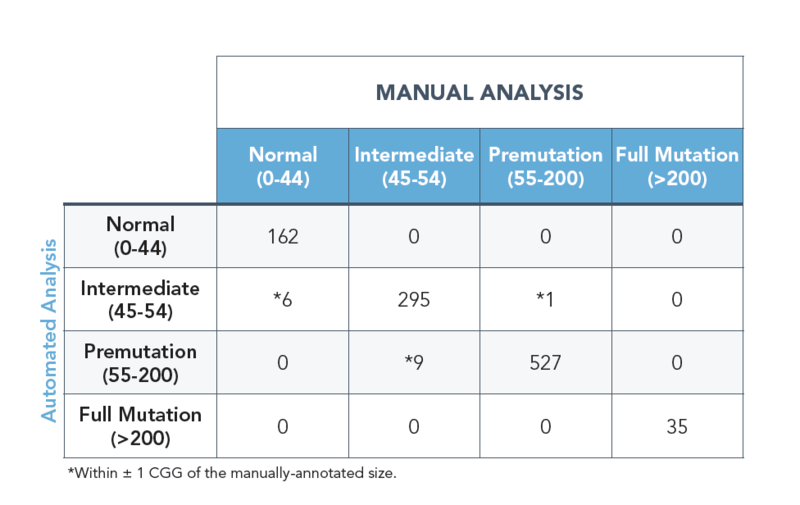 **Concordance table comparing the accuracy of automated and manual genotyping of 1035 residual clinical samples, grouped by size category according to ACMG guidelines. All samples were sized within ±1CGG of their manual annotation and within ACMG accuracy guidelines. Accordingly, 1019 samples (98.5%) were placed within their appropriate category, whereas, 16 samples (1.5%) bearing borderline genotypes (within ±1CGG of the category border) were placed in adjacent categories. Care should always be given around framing borderline categorical calls. **Challenging sample highlighting accurate annotation of mosaic gene-specific products by the Reporter software. Green dots indicate calls made by the algorithm, for example, the detection of both primary and mosaic gene-specific products, thereby delivering superior sensitivity. **Example of accurate annotation of low-abundance gene-specific products by the Reporter software. The detection of a low-abundance (5%) full mutation even in a low-abundance state provides evidence of high sensitivity. **Example highlighting annotation of similarly-sized gene-specific products indicated by the blue arrows representing calls made by the algorithm. AmplideX PCR/CE FMR1 Reporter is also capable of resolving saturated side-by-side peaks which reduces interpretative ambiguity and sample reruns. **Example highlighting annotation of expanded minor alleles by the AmplideX PCR/CE FMR1 Reporter software. Blue arrows indicate calls made by the algorithm such as a premutation sample with a minor allele. The AmplideX PCR/CE FMR1 Reporter*, a highly accurate, automated FMR1 analysis engine and software interface improves the efficiency and consistency of capillary electrophoresis-based assays targeting the CGG-repeat region of the FMR1 gene. >1000 clinical samples processed using Asuragen’s AmplideX PCR/CE FMR1 Reagents* were genotyped using the AmplideX PCR/CE FMR1 Reporter* resulting in 98.5% agreement to manual analysis. The remaining 1.5% clinical samples were called within ACMG accuracy guidelines. The software also demonstrated high sensitivity to detect low-abundance gene-specific products, therefore providing the user with confidence that mosaic or minor alleles, including premutation and full-mutation alleles, will be detected according to the laboratory guidelines. The software accurately flagged sample failures. Failure modes included identification of poor amplification and various ROX ladder issues seen in practice. 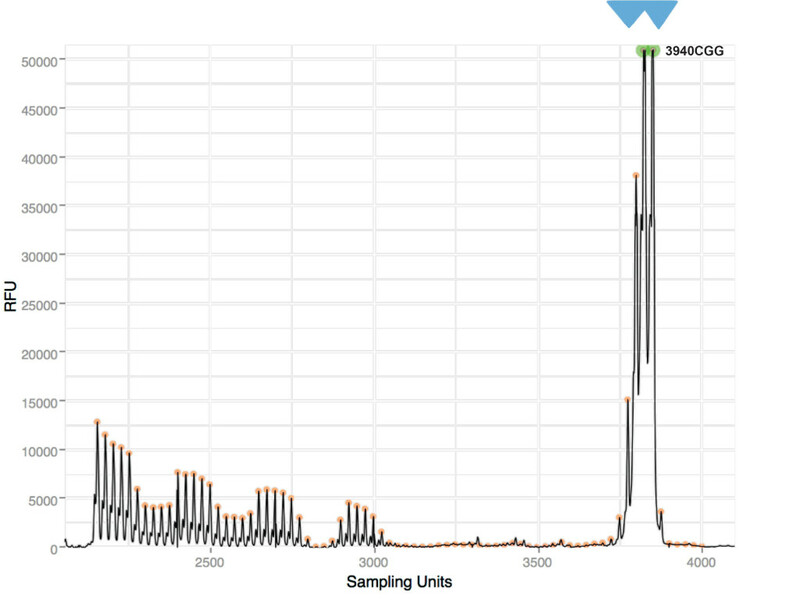 This software can improve analysis times for FMR1 assay workflows by a >100 fold reduction in time spent for manual analysis (assuming manual analysis requires approximately 1 minute of human analysis per sample versus 1.5 seconds of analysis for a full plate by the AmplideX PCR/CE FMR1 Reporter software), and also has the potential to improve inter-operator consistency in resolving CE profile ambiguities. ACMG Standards and Guidelines for fragile X testing: A revision to the disease-specific supplements to the Standards and Guidelines for Clinical Genetics Laboratories of the American College of Medical Genetics and Genomics. Monaghan, et. al. Genetics in Medicine 2013, 575-586. FMR1 CGG allele size and prevalence ascertained through newborn screening in the United States. Tassone, et. al.Genome Medicine 2012, 4:100.